From the Mexican resort collection that brought travelers Guacamania, a celebration of the avocado, this May, coconut is the star. Guests at Velas Vallarta in Puerto Vallarta will be treated to special menus, drinks, spa treatments, activities and more featuring the refreshing fruit. 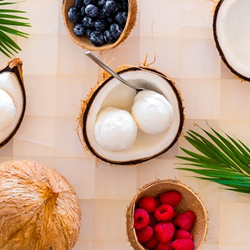 The many themed drink and snack options range from a Pineapple & Coconut Margarita, Coconut Horchata, and Coconut Lemonade Mocktail to Blueberry Coconut Smoothie Bowl, coconut shrimp ceviche and even a Coconut Ice Cream Sandwich. A four-course coconut tasting menu at Andrea Restaurant complements special dishes and sauces with coconut at the main ingredient at La Ribera. Offerings are available at La Ribera for breakfast, lunch and dinner. Guests looking for a quick dessert can find special coconut crepes with coconut ice cream at the resort’s crepe stand. Coconut also stars in a new spa treatment. A 55-minute relaxing massage with coconut oil is followed by a 55-minute coconut scrub exfoliation. A coconut-based body cream is applied at the end of the treatment and glass of coconut water is served, rehydrating the body internally. The cost of the spa treatment is $170 USD. Additionally, the resort’s Kids Club will introduce a new activity where young guests can create their own personalized bowl made from coconut shells. Kids will use glitter, paper, crayons and more tools to decorate their coconut masterpieces which they can take home as a memory of the trip.